The large loaves of sweet and sour bread from Gavari are just perfect for bruschetta. 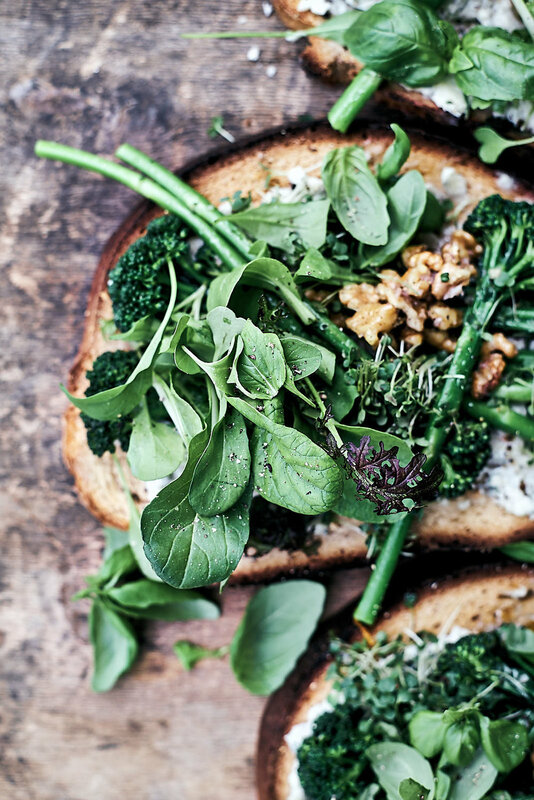 With blue cheese and broccolini – ideal – or with beets, lettuce and blue cheese or tomatoes and basil. If you don’t want such a large slice or are making it for a party, it’s just as easy to cut the slices into more manageable pieces to take and eat, as desired. For the cream, mash the blue cheese and rosemary in a dish. Add the cream and mix well. You can also process it, but keep some bigger pieces of the cheese. Heat a grill pan or the oven and grill or bake the large slices of bread until they are crisp. Cool slightly. While the bread is cooking, bring water to boil, add a tbsp of salt and the broccolini. Boil for 2-3 minutes, drain, and plunge into an ice water bath to stop the cooking process. When cool, strain. Heat a pan and place the garlic, rosemary, oil and walnuts and sauté about 4-5 minutes. Add the broccolini and cook on high heat until just beginning to turn brown. Spread the blue cheese on the bread, top with the broccolini mixture and drizzle with the oil from the pan. Add lettuce, sprouts, basil, and pepper. Serve.